Violinist Olga Šroubková has become the winner of the 35th year of the Rodolfo Lipizer International Competition in Gorizia, Italy. From the 3rd to the 11th of September 2016 this year, the 35th year of the prestigious “Premio Rodolfo Lipizer International” violin competition was held in the Teatro L. Bratuz Gorizia. Violinist Olga Šroubková successfully participated in it, and took an excellent 1st place among strong international competition. It was decided by an expert international jury composed of: Roberto Molinelli (chairman and Italian musical composer) and violinists Helfried Fister (Austria), Armiram Ganz (Uruguay), Zanta Hofmeyr (South Africa), Fulvio Žarko Hrvatič (Italy), Magdalena Szczepanowska (Poland) and Suli Xue (China). The success in the Italian competition certainly does not belong among the first awards for this promising young violinist. Olga Šroubková is laureate in a number of Czech and international competitions, of which we will at least name 1st prize in the BRAVO! International competition in Namur, Belgium, 2nd prize in the Kloster Schöntal international competition in Germany, 4th prize in the prestigious Chinese International Competition for Young Musicians and 1st prize in the Chengdu International Violin Competition; she is a winner of the Bohuslav Martinů Foundation competition and holds an award for the best interpretation of a B. Martinů composition. 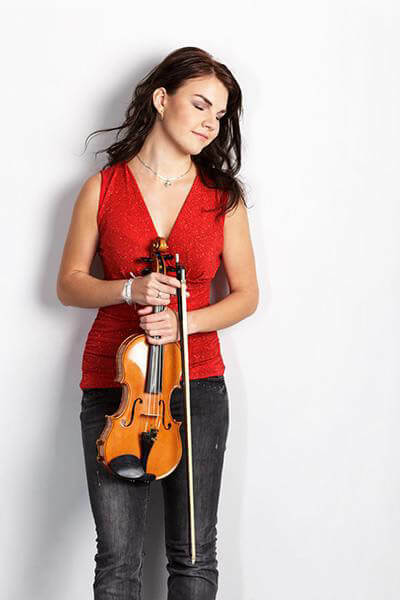 She currently studies at the Hochschule für Musik, Theater und Medien Hannover, under the leadership of Prof. Adam Kostecký, and works as guest concertmaster at the Czech Philharmonic.